Sometimes referred to as “Qin’s Armies,” the terra cotta warriors’ purpose was to help the emperor rule an empire in the afterlife. The Terra Cotta Army excavation comprises three pits, which together are estimated to hold 8,000 soldiers, 130 chariots with 520 horses and 150 cavalry horses. Most are still buried. According to legend, the warriors were real soldiers who were buried with Qin to protect him from dangers in the next world. *Garnet Sage \`gär-net `saj\ n [fr. Tom Hallowell ’29, upon celebrating his 50th class reunion] (1980): a graduate of Swarthmore College who has celebrated his or her 50th class reunion. Join the Garnet Sages at 11 a.m. on Thursday, March 18, 2010 to tour the Terra Cotta Warriors exhibit at the National Geographic Museum in Washington, D.C. Soldiers. Charioteers. Archers. Musicians. Generals. Acrobats. 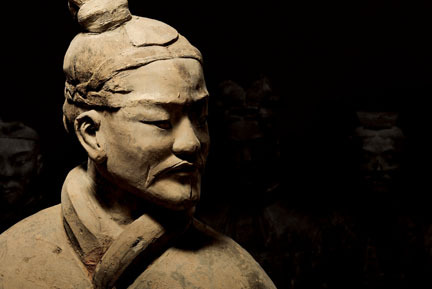 Nearly 2,000 years ago, thousands of life-size clay figures were buried in massive underground pits to accompany China’s first emperor, Qin Shihuangdi, into the afterlife. Their discovery outside the city of Xi’an in 1974 was one of the greatest archaeological finds of the 20th century. Now, Swarthmore Sages can stand face-to-face with these terra cotta warriors. The National Geographic Museum will host Terra Cotta Warriors: Guardians of China’s First Emperor, an exhibition featuring treasures from the tomb complex including 15 life-size figures, weapons, armor, coins, and more. Don’t miss this chance to see the largest collection of significant artifacts from China ever to travel to the United States. All Garnet Sages who have reached their 50th reunion are eligible. If you would like more information, please contact Astrid Devaney at adevane1@swarthmore.edu or (610) 328-8412. 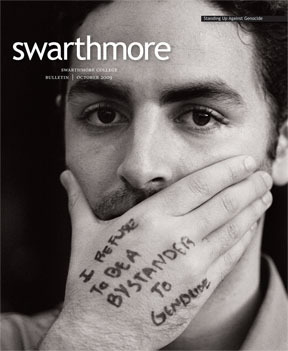 Did you remember your Swarthmore gear?